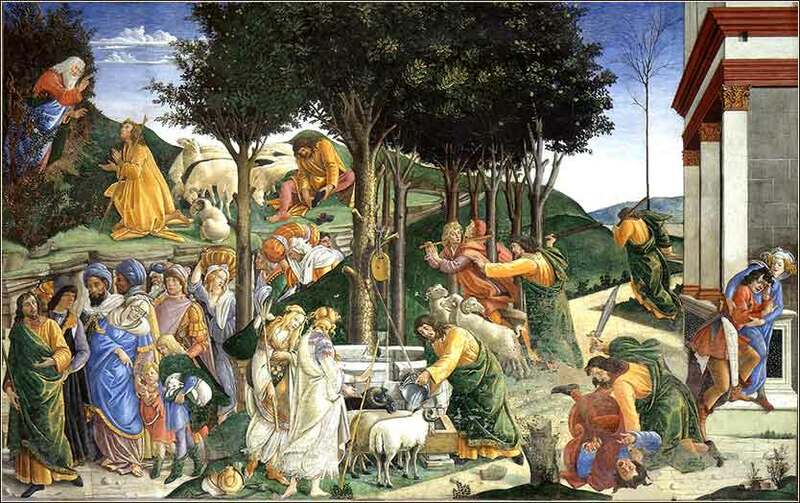 The Trials of Moses, fresco in the Sistine Chapel by Sandro Botticelli, ca. 1482. There are seven scenes from Exodus in this single painting. Moses is always distinguishable by his yellow dress and the green cloak. This beautiful ballad was adapted from an Irish folk song. Detail from the painting at the top, The Trials of Moses, depicting the exodus from Egypt. 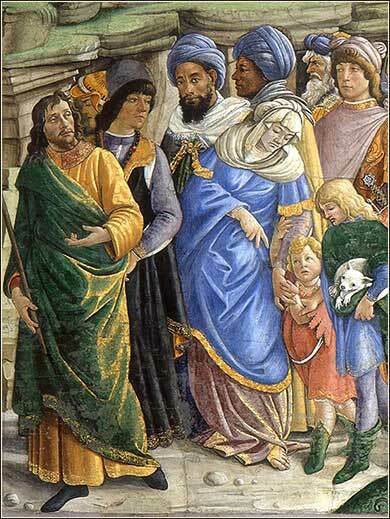 Despite the general Renaissance Italian appearance of the people, Botticelli accurately reflected the racial diversity of the Jews. In all the travels of the Israelites, whenever the cloud lifted from above the tabernacle, they would set out; but if the cloud did not lift, they did not set out — until the day it lifted. So the cloud of the Lord was over the tabernacle by day, and fire was in the cloud by night, in the sight of all the Israelites during all their travels. Thus ends Exodus. It is a happy ending: the Covenant has been reaffirmed and God is with the Hebrews, His presence guiding them directly. The pillar of cloud and light which had gone before them when they left Egypt now resides in the magnificent tabernacle they have built. 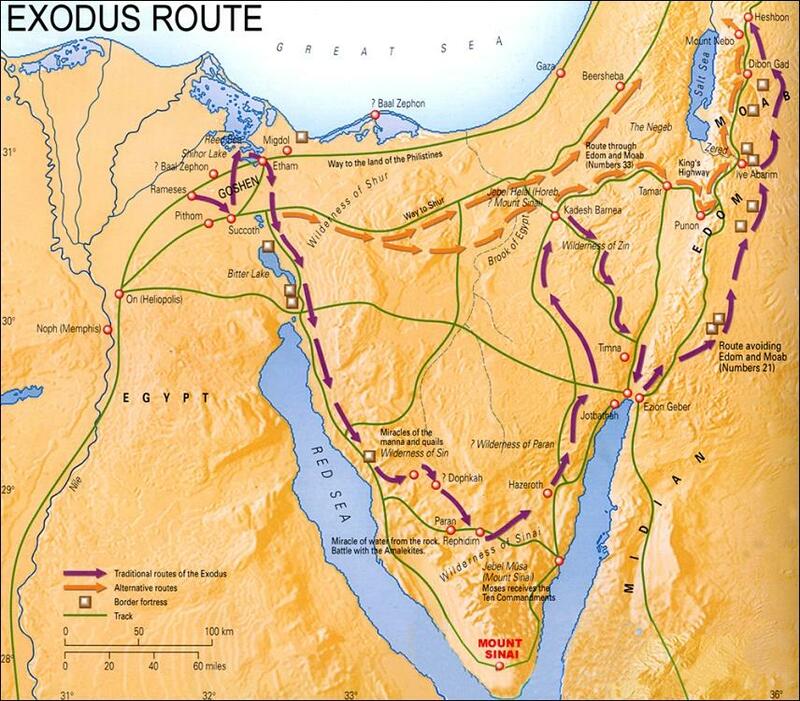 It took them sixty days to travel from Egypt to Mount Sinai, and they stay at Sinai for a total of about two years. (We do not know how long it took to build the Tabernacle.) The forty years in the wilderness does not occur at Sinai, but to the east, in the Wilderness of Paran. After an unsuccessful attempt to invade Canaan from the south, they will travel north up the right bank of the Jordan and eventually, led by Joshua, invade Canaan from the east. Reading Exodus closely has been quite a journey for us, as well: almost five months. We hope it has meant as much to all of you as it has to us, but it was a bit exhausting: do not look forward to reading Leviticus cover-to-cover on Daily Prayer any time soon! Of the three remaining books of the Pentateuch, Leviticus is the most tedious to read. It consists entirely of an exhaustive collection of laws and rituals for the guidance of daily life. Much of Deuteronomy, similarly, consists of discussion of laws, although it is more oriented towards how the Hebrews will conduct themselves once they have entered Canaan. It also recapitulates much of Exodus. But Deuteronomy appears to end the Hebrew wilderness saga, for it ends as the Hebrews are about to enter Canaan. Moses dies without entering the Promised Land, and Joshua is named as his successor. Numbers is an odd duck, as it is outside the time flow of the four-book epic. The history of God and man, from the beginning of time until the Hebrews enter Canaan, is completed at the end of Deuteronomy. Numbers begins at Mt. 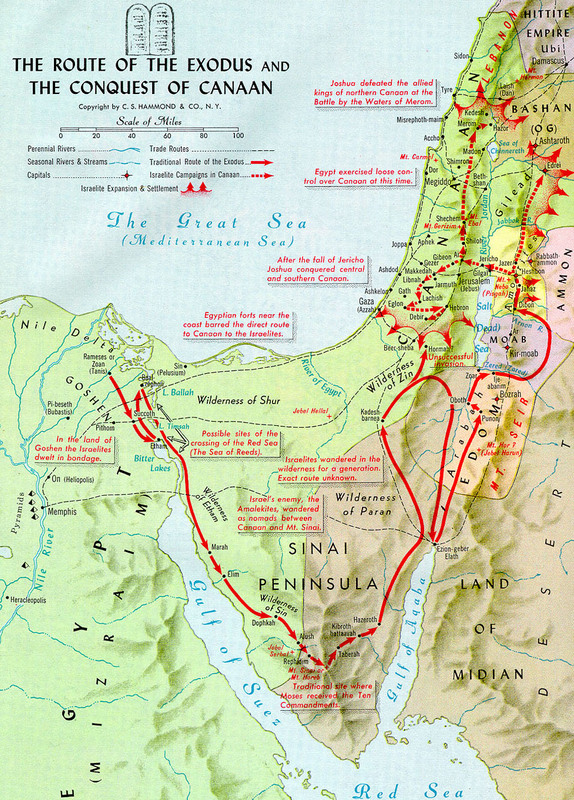 Sinai with a census of the Hebrews — hence its name. A census, as we discussed previously, was a preparation for war, and Numbers concerns itself much more with matters of conquest and land division than the other books of the Pentateuch. It also gives more detail about the forty-year journey to Canaan, with many anecdotes not found elsewhere. There are interesting matters in all three books, especially for the serious Bible scholar, but if you want to read one or more of them, be forewarned: they are heavy sledding. Numbers is probably the most readable, but even it contains thousands of words about legal minutiae; it is actually longer than Exodus.